When looking to purchase a used commercial generator for your business operations, industrial applications, or facilities, there is a lot of information to process. There is so much research, careful planning, and coordination involved. Buying a used generator isn’t simply about just picking a generator out of a lineup and calling it a day. Buying a used generator involves research on generator brands, fuel types, attachments/modifications, operational power needs & requirements, and service & maintenance. We have come up with a general guideline to steer you in the right direction and help you get started on taking your first step in purchasing a generator that’s right for you. The first step when buying a commercial generator is to assess your power needs & requirements. This process is called sizing a generator. When sizing a commercial generator, you need to take in account all key equipment that needs to be powered by the commercial generator. Aside from emergency lights and other key utility services that ensure safe working environments for your employees or providing a safer route of egress, what equipment or machinery (if any)will need to continue running? Consult with a master electrician to determine your total power needs and requirements. Fuel type determines the type of fuel that your generator will run on. This is one of the single-most important factors to consider before making your commercial generator selection. The two main commercial generators used in the market are diesel and natural gas generators, each with their own pros and cons. Diesel generators are the most commonly preferred generators used for emergency backup power solutions, but the downside to these generators are the acquisition costs and limited fuel tank capacity. The maximum duration a diesel generator can run over a period of time is limited to the fuel capacity of the fuel tank. If choosing to go with a commercial diesel generator, you will need to pre-plan for contingency measures. If the power goes out, will you have staff appointed to ensure that diesel fuel is constantly replenished? You will also need to secure a steady supply of diesel fuel to replenish the tank. This may pose a challenge in emergency situations, such as hurricanes or inclement weather, such as blizzards or severe Winter weather storms. A key benefit to diesel generators is lower maintenance requirements when compared to their natural gas counterparts. Diesel generators also commonly come in portable units, since on-board fuel tanks can be mounted along with the generator onto a double-axle trailer mount or mobile chassis to help transport the generator from one location to another with relative ease. This level of versatility gives diesel generators an overall edge compared to natural gas generators, especially when performing industrial applications such as construction or mining work when apart from the main power grid. Natural gas generators generally have a lower cost of acquisition, but also come with their own pros and cons. Natural gas generators have higher maintenance needs, as natural gas generators use a highly combustible fuel source. Periodic, regular inspections and service must be conducted in order to ensure there are no hazardous gas leaks. Also, if you are in an area that is prone to natural disasters, such as earthquakes, wildfires, hurricanes, or tornadoes, the utility companies most commonly shut off gas lines to prevent explosions. Benefits of a natural gas generator is that simply put, do not have restrictions or limitations to fuel supply in the way of a fuel tank, because they are connected directly to the natural gas pipeline in your area. If a natural gas pipeline is readily available around in the installation location of the generator, getting connected should be fairly simple and straightforward, providing a steady supply of fuel without worry about a depleting fuel tank. One point that we would like to emphasize when purchasing a used commercial generator is to find a reputable dealer. A reputable dealer will be able to provide as much information as possible about the generator and will be able to field any questions you may have about your generator needs. There are many websites out there with fake sellers on platforms like Craigslist that attempt to scam customers that are looking to make a generator purchase. Reputable dealers are also able to verify key information about the generator you are interested in purchasing, such as hours, condition, provide photos, and what the generator was mainly used for, etc. When buying a used generator, be sure to check on the age of the generator, the number of hours on the generator, primary usage of the generator prior to being sold to the dealer, service & maintenance history, including any/all records associated with the generator, brand manufacturer, and brand manufacturer warranty (if available). These are important factors to consider when you’re looking to buy a used generator to help ensure you are getting the best possible product prior to your purchase. After you have gotten as much information about the generator in question, be sure to lock in your choice. After you confirm your generator selection, the next step would be to organize logistics for the transportation of your new purchase. Speak with the dealer to see if they offer generator transportation services that include rigging to help ease the process. Most generator dealers offer transportation services and for those who do not, they usually have a network of freight companies that assist them in the transportation logistics of commercial generators. After the generator is delivered, then comes the next stage of site planning for generator installation, which is preparing the on-site installation location and the actual installation itself. There is a lot to navigate when buying a used generator for your business operations, industrial applications, or facilities. There are many considerations that need to be taken into account before moving forward with your purchasing decision. Woodstock Power Company specializes in buying and selling new, used, surplus, and rental generators. We work with companies all across the country, including top Fortune 100 and Fortune 500 companies. We provide key details regarding each generator we have in stock within our inventory and our generators are all inspected, serviced, maintained, and load bank tested to ensure a smooth generator installation process. 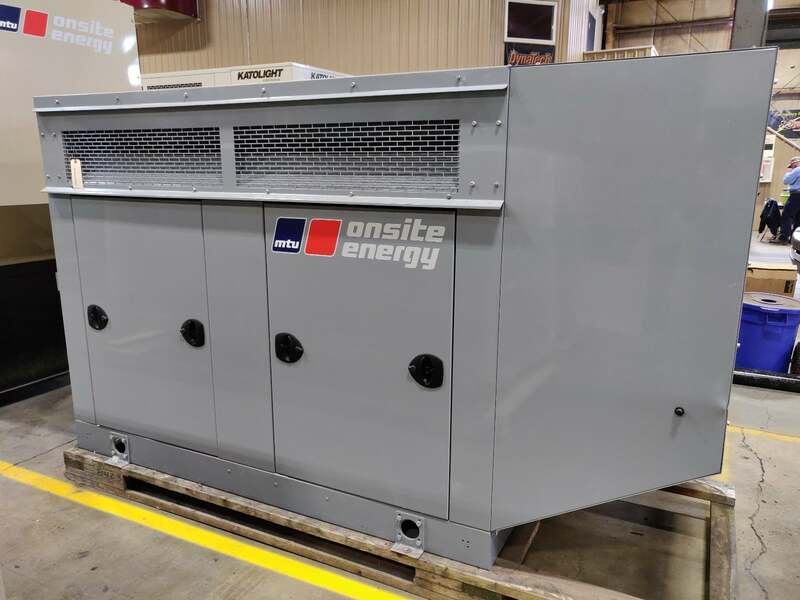 If you are looking to work with us for your commercial generator needs, you can head on over to our inventory page to check out what we have in-stock or give us a call. We would be more than happy to speak with you and help meet your needs. We are industry leaders in buying and selling used generators to fit the needs of many businesses, including commercial, industrial, medical, agricultural, and university. This includes facilities like hospitals, better living centers, nursing home, airports, hotels, resorts, restaurants, retail centers, manufacturing, production, and more. Woodstock Power Company sells new, used, surplus, and rental generators. We work with companies all across the country, including top Fortune 100 and Fortune 500 companies. We provide key details regarding each generator we have in stock within our inventory and our generators are all inspected, serviced, maintained, and load bank tested to ensure a smooth generator installation process. If you are looking to work with us for your commercial generator needs, you can head on over to our inventory page to check out what we have in-stock and fill out our Contact Form. We would be more than happy to speak with you and help meet your needs.